Hero MotoCorp, a strategic partner with Erik Buell Racing, has just unveiled the HX250R Sport model to the Indian press. This single-cylinder 250, which naturally competes with the Honda CBR250R and other similar models, was heavily influenced by Erik Buell Racing, particularly with regard to engine and suspension design. The published specifications for the HX250R are below, and a couple of interesting facts stick out. First of all, the single cylinder has a very large bore and short stroke in comparison with the competing Honda 250 (soon to be a 300 in some markets). Additionally, although both bikes appear to have the same fuel capacity, the Hero HX250R has a curb weight that is claimed to be 53 pounds lighter than the Honda! The Hero also has a fairly large 300 mm front disc brake squeezed by a three piston caliper in a combined braking system with the rear 220 mm disc. Tire sizes are similar to the Honda, although the front tire on the Hero is a taller 80 section, while the Honda front tire is a 70 section. 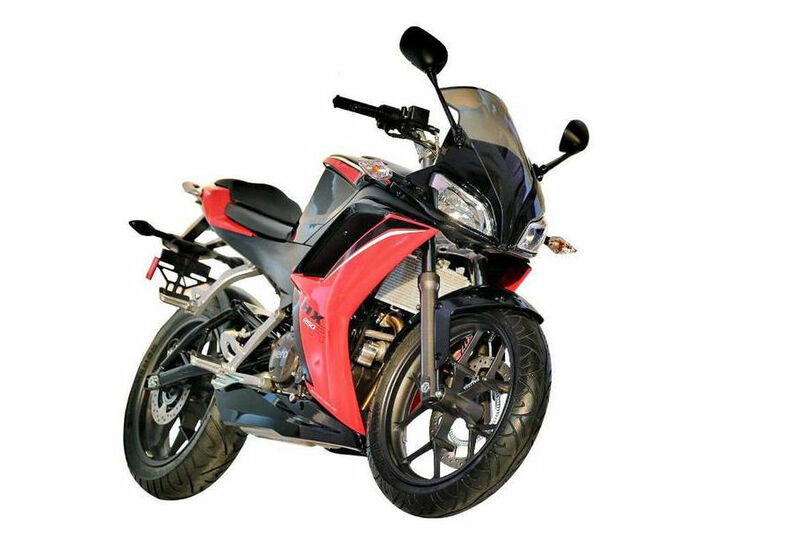 Of greater interest to the U.S. market is whether EBR will distribute this Hero 250 in the United States in the near future pursuant to its distribution agreement with Hero. Seems like a logical fit given the popularity of 250s here. But, is there some standard weight person that’s riding these bikes to measure the acceleration? A 50kg rider is going to have a significantly different acceleration than a 70kg rider at these weights! People will buy this IF it is competitively priced. EBR can build a great performing bike, but can he build it for a price that riders are willing to pay? LOL – you have no idea. Every time an HX250R is sold, an 1190RX gets its spark plugs. I think we might be seeing a glimpse of just where this EBR/Hero partnership could be headed…with the engine being this over square it really wouldn’t take much to go from a 250CC spec to a 350CC spec. Just a guess but making the Indian market version with these dimensions means lots of room for the bigger valves it would take to let a larger version breath. In other words, the hardest work – top end and bottom end design – is pretty much done. Lengthening the stroke is all about piston speed and rod material more than any additional “harder” design work. Taking just the stroke to 70MM – displacement of 360CC – gives you a reasonable piston speed of under 24mps – closer to 23 actually. If you kept the top end the same, you could tune the 360CC version for good low-end torque and with a top-end change to allow larger valves – and a new cam – make way better mid-range and top-end power. Most of the engine could stay as-is meaning that rings, gaskets, bearings, oil pump, and most importantly cases and cranks could be shared between different displacement and different performance spec versions. I am not a tuning expert, but I don’t see how to mathematically stroke an engine without changing the crank.! no worries, that’s what you got me for. A: you can’t. maybe he means, the NEW crank and NEW cases could then be shared. you’re not grinding/welding a journal for 21mm. And this Blast will stomp any 250cc bike made today – so watch your mouths! May win a drag race with a 250 but longevity seems to be an issue. Read down, that thing has major break downs regularly it seems. Cool update of a Blast though, I’m sure it’s fun to ride when it’s running. Hardly – it was the most reliable bike produced by HD. Many have modified it way past it’s intended purpose and have had a world of fun doing so. Americans see this bike – the HX250R – to have similar potential and look forward to it’s arrival. I like the attention to more braking power as well as the larger section front tire. I also like the tall-ish windscreen & raised bars in combo with the sportier look than most all other bikes of this size in that market. I’m hoping the partnership between EBR & Hero proves to be a win for all. Quit being knuckleheads (see what I did there?) and bringing up the B-last. That was just another link to the Sportster engine line. I owned one of the Rotax 1125 Buells and while I eventually found it to be a bit too intense for my old-hippie self, it was a really great machine. I’m confident we will see pretty slick stuff from Buell/Hero. Erik’s pretty damn smart and cool you HAVE to admit. Just got shang-hied (sp?) by boring clowns at HD. I would be worried about how they made it 50lbs lighter than the honda 250. I love how it’s compared to the honda countless times. This bike wouldn’t even be allowed to eat in the same restaurants as a honda. That’s some really lovely “heavily influenced by Erik Buell Racing” suspension on the front end. I’d rather take the bus. What may be of help is look at the seat. It is decidedly single. If it was twin as on Honda it would require quite a bit bigger and heavier structure. Also, fact of the matter is that all makers tend to make frames a suspension more heavy than it needs to be; probably as precaution and redundancy. The frame itself carrying relatively light engine does not need to be as heavy, but two occupants plus shocks (increase with resistance by carried mass) into frame from suspension make quite a bit of difference. I am quite certain that the Hero is a two-seater. It has grab handles and everything. So they are not losing the weight from the sub-frame. I can’t see them employing aluminum or a higher quality steel for the frame, subframe and swingarm that allows for thinner wall thickness on such an inexpensive bike, but that is what it would take to weigh in that much less I would think. That, or the chassis may be as rigid as a dente spaghetti. If the seat is “decidedly single” what are the extra foot pegs for? I see two sets of foot pegs. I overlooked them. You got me. In that case all that rationale is in question. I get what you mean though. Where can you lose 50 lbs from a 250cc budget bike? Aren’t people here usually wondering how hard manufacturers must work to make a 250 weigh 375+ lbs, though? No, 1200cc adventure bikes with full luggage shouldn’t weigh more than 375 lbs. It is insane that 250’s weigh more than 80 lbs. soaking wet. Excellent – that made me grin. Thanks! It weighs 50# less than the CBR on paper only. We’ll find out what it really weighs when one makes it over to our shores, if ever. Until then it is only over zealous marketing hype. Why worry? KTM’s 390 Duke, with almost twice the power, weighs 139kg. and seems to be sturdy enough to hold up well enough at what has to be a faster pace than the Honda will ever muster. I believe the Duke 390 rings in at 154 kg (340 lbs.) wet. In any case at almost three times the price, the KTM shed weight and added strength the expensive way. We are all curious how this inexpensive little character accomplished its feat. It’s made in freaking INDIA not Wisconsin that’s how costs are kept down. All of these small displacement bikes are made in emerging markets, so that doesn’t explain it. 3 words… carbon fiber monocoque. no seriously, logic dictates the bike is prolly not 50 lbs. not sure what world you guys reside…? but in my world, the human propensity for error explains away like 99% of all things. hell, the missus points mine out to me everyday. could somebody have forgotten to multiply X times Pi then carry the 1 and it’s actually 53 kilos…? I suspect it is more likely the marketing department’s propensity for exaggeration than human propensity for error. if its only 20lbs, saying its 53 isnt exaggeration…? that would be a blatant lie. a lie that would obviously come out in short order. laymen can be fooled, but not the industry. journos would eat them alive. If the difference is that drastic, then no, exaggeration doesn’t cover that. If there is an error, I’d think it is a dry vs. curb weight spec. I’d love to see EBR have a bunch of India built/US designed bikes to sell here and shock all the other MC brands. I also hope some of these Hero bikes have accomodations for carrying stuff too, something Erik seems to ignore. I hope it succeeds so demand for 110/80-17 radial tires will go up! So I wonder if EBR would distribute this Hero 250 or if they would stroke the engine, massage it, bling up the components a bit and offer say an EBR 325RX as an upscale offering to the small bike market. take it ez greezy, we’re getting ahead of ourselves. let’s first see if we can register/title a single unit…? before we go setting fire to a stack of the new blue benjamins. Good try, but this is still a “speciality” bike, obviously driven by racing passion. But, is RACING all that necessary for most people (I sure understand it is for Mr. Buell)? Where is machine for masses in between 400 and 500cc nor burdened with stylish plastic cloak and unnecessary(for most part) liquid cooling? I have not seen it yet. No. This is not a “specialty” bike. This is a bike that will be built, probably in the six-figure-production range. Hero sells 300,000-350,000 bikes… a month. In India. That’s more than what the “MoCo” builds in an entire year. Worldwide. Inexpensive 250cc bikes are THE mode of transportation in the sub-continent. Sporty models are becoming more and more popular all the time with younger Indians. The American market is barely a blip in sales for motorcycles worldwide. China and India are where the action is where sheer numbers are concerned. That being the case, this is a very important model. Making it 400-500cc would make it too expensive for most of its potential customers in more ways than a few. Not cloaking it in plastic won’t appeal to the youthful market they’re looking to sell to. Oh, that’s right – India already has a “machine for the masses” (even if it’s a bit of an aspirational brand there) of about 500cc, unburdened by fairings, and without liquid cooling! Can you guess what it is? This, to me, is a pretty slick move. I am interested to see how well it does, and if it makes it to the American market! You are referring to Enfield obviously. As my reading goes they do very well in India and elsewhere including England. It comes to style, need and taste preference after all. Somebody (perhaps youth) will prefer “racer” and someone else more “utility” type with decent ergos. All matter of choice, as it should be. On my part, even with my curious criticism, still wish Hero-Buell success. The 250 capacity is actually due to licensing constraints in markets out of the US, just about every other nation you have to progress up to a litre bike, where US riders can just jump on any bike. This US is a niche market of bigger=better when looking at sales; until recently with the re-introduction of the small capacity bikes. As you say, the trend might have bounced off the ceiling and will continue more towards original intent of motorcycle and away from 2-wheel luxury car. The size restrictions in some countries are funny and break to progress. In addition China does not want motorcycles in cities at all (not in Beijing). Seeing as these bikes are viewed and generally purchased by new, younger riders it will be interesting if this makes it to the US and what kind of reception it gets. While longtime riders certainly know the name Eric Buell and he’s rather viewed as a maverick is fine. But riders new to the sport may very well draw a blank. I was also thinking of that quite over square engine design. Those type of extreme dimensions can lead to extra valve area and power but at the expense of anything down low? It’s all conjecture now until we find out in person what has been wrought. You are correct: with this approach they box themselves into design which needs high intensity attention. Definitely not for so much advertised “relaxing ride”. In contrary, Honda was wise to proportion bore and stroke to produce lot more versatile and enjoyable engine. Who would argue with their experience? I suspect the very over-square parameter of the engine may be intentional as part of a multi-displacement platform. 250cc is still an extremely important displacement, but 300+ ccs is growing in importance in the US for sure, and I suspect in other large markets as well. That’s a stroke away with this engine. Increasing stroke substantially means different crankcase which means everything must change. That kind of defeats the purpose. But didn’t Honda do just that with the upcoming CBR300R? Just a change in stroke (286cc) to the CBR250R’s engine. A nice and cost-effective increase in performance. If the design was engineered with multiple displacement options in mind, production changes would be relatively minimal. Yes, “if”. In any case, to facilitate longer crank needs more space. To make this into 350cc with same bore requires to increase stroke by 19mm or enlarge case to 38mm across. Not an easy task without blowing everything up. Yes, well my post was an “if” statement afterall. 🙂 And if they are planning that large of a stroke for other markets, then the case is already built to accommodate. But yes, that is an “if”. We’re in the information era. People who don’t know Eric Buell can use the googles and find out all about him in 10 minutes. We all did it without the internet when Ducati’s 2nd coming happened in the 90’s. Man, can you imagine being 16 today? The motorcycles are far more exciting than the ones we had to choose from in 1966. I ended up with an Italian Aermacchi 50cc 2 stroke 3 speed on the handlebar. Still…I was riding! Would have thought I had died and gone to heaven had I had something like this. Although I think most 16 year olds that are interesting in riding these days have their eyes on 600 cc super sports. Yea, I don’t see many 60+ year olds running around on these. There may be a few, but I’m afraid most of us old farts are stuck riding liter bikes or better these days…or at least 650 Burgmans. Funny, I watched my dad go from riding Indian and Harley dressers down to a 125 cc Honda as he got old. I’m now probably within 6 years of my dads age when he retired from riding and I’m still pedaling around on 1100s and 1300s. Wonder what fate has in store for me over the next 1/2 decade. Who knows …. a 250 may very well be in my future. I may have to take my statement back. I have to sleep in my Nikes so’s I can run for the commode as soon as I wake up. TMI, TMI, TMI. I was 19 in 1973 when I purchased new a Yamaha RD250 (blue). That bike ripped and about the only modern 250 that could vie with it is a pregen Ninja, but only above 70. Below that the RD would eat it alive. This bike will most likely have some variants, allowing Hero to enter into the USA market with a few bikes rather than just one model. If successful, then this is only the tip of the iceberg, with more offerings from Hero. It would be wise for dealerships to add EBR/Hero to their showrooms. right now, you’re standing in New Delhi, yes…? The Kawasaki 250 has been a massive seller in the US for many years. Maybe there isn’t one outside your window, but so what? Pretty interesting for sure. It would probably spank a Blast, being so much lighter with similar power. I’d love to see these here to reduce the monotony of seeing little Kawasakis and the occasional CBR250 everywhere you look. it might be better if we don’t use the Blast as a yardstick of comparison for ANYTHING. I disagree. It made a great looking cube of garbage in those “2010 Buell Blast” ads. I suppose that was the most mass-centralized bike of all time. I don’t see enough of the smaller bikes here at all for them to become monotonous. Monotony comes usually from the other end, in the big cruiser segment. Depends on where you’re at. In the San Fran area, cruisers are definitely a minority. That must be the only place in the US where that fact holds then. I think that an anvil or a tree stump could probably spank a Blast. Also big news: a hybrid scooter and a diesel scooter concept. Couple key facts about the HX250R: It will be priced around $2500 in India, which is right around what the CBR250R sells for there. It also has a claimed 31 bhp output, 5 more than the India-market CBR250R. Hero must have shown Erik B. the CBR and said, “build us a better bike we can sell for the same price!” And he may just have done that. I think the super-short stroke has performance benefits, but more significantly, could allow a range of larger engines based on this one, maybe for the US market. We know Erik likes big Singles, right? I’d link to another blog where I’d seen it referenced, but I think that might be bad form. But, the price in India being the equivalent of $2080 from what that said. exactly the opposite of what one gets from centrally controlled economies. you sure…? wow that’s a lot of win. but is that all it does…? or might there be some negative repercussions that a “me first” 24/7/365 consumer mind might cause one to overlook…? That would be akin to calling it the Albatross. I am not sure just how you can make the jump and compare this bike to a Blast. I hope that Eric designs a full line of bikes for the Hero company. If we can’t build them here then we can design them here. That is good enough for now. That was a joke :)Thus the smiley face. They do entertain the same market niche though.I would love to see Erik use Hero to bring in some affordable quality bikes!